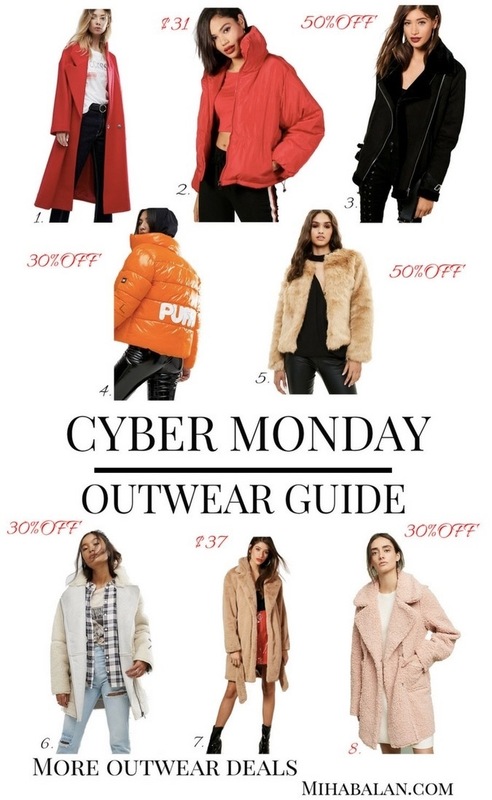 The 3th but not last post with Black Friday/Cyber Monday offers features is about outwear : coats, jackets for this season. It was really hard to decide which ones I should pick for you guys since I kinda wanted them all but I hope you like these. Quilted Jacket it is now on SALE for $31 ! Faux Fur Trim Aviator with Belt now in SALE for $49, very warm and perfect for winter. Puffa Original oversized jacket $143 but you can use the code EPIC30 to get 30%OFF. Brown Faux Fur Coat $111 usethe code FETCH50 to get 50%OFF. Luxe borg biker Jacket $127 use the code EPIC30 to get 30%OFF. Belted Faux fur Coat now on SALE for $37 (extremely good price). Blushed Sherpa Coat $178 but I simply love this coat. Wool Blend Coat on SALE now for $151, comes in black as well. Suede Aviator (like the one I have in the pictures) use the code EPIC30 to get 30%OFF. Shiny Khaki Parka on SALE now for $70. Bonded Borg Coat on SALE now for $60. Pink Oversized Coat for $111 but you can use the code FETCH50 for 50%OFF. Remember that the offers and the sizes are only available for limited time. Any coats or jackets that caught your eyes?